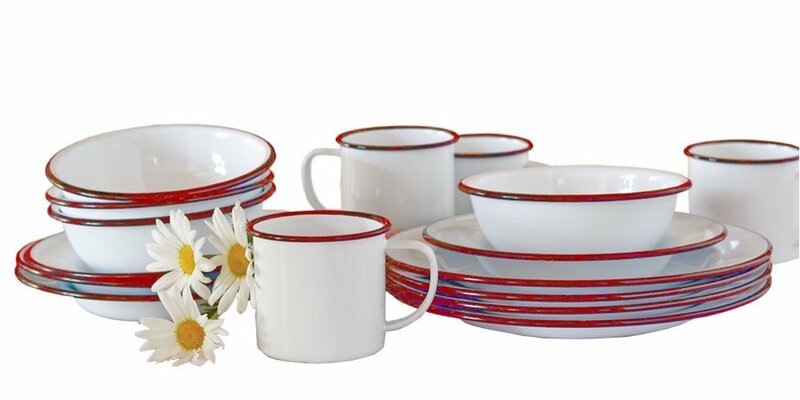 Enamel dinnerware is pretty amazing because it is sturdy and durable. It is widely known as unbreakable dinnerware. That makes it is ideal for use as outdoor dinnerware, camping dinnerware, dinnerware for children, college dorm dinnerware, or for families that are hard on dishes. Enamelware is also available in decorative dinnerware and cookware pieces which are great for complementing various types of home décor. This type of dinnerware and cookware is commonly used in rustic and western décor. Enamel dishes are usually oven-proof and dishwasher safe and they are incredibly easy to clean. Most are made of metal with enamel coating, which means that they should not be used in the microwave. There are some safety concerns to look into concerning use of enamel dishes, but once addressed, they are great for everyday use. Enamel dinnerware presents many opportunities as unbreakable dinnerware. Vintage enamelware is desired by many, mostly for decorating, but sometimes for use. Vintage western dinnerware is often used in rustic and western décor themes. Coleman is renowned brand of camping dinnerware made of enamelware. The dinnerware is often described as speckled blue enamel dishes, enamel camping dinnerware, or red enamel dishes. This company was founded in 1900. Crow Canyon Home is a business located in San Francisco, California that takes pride in their selections enamelware. They've been in business for over 30 years and their selections consist of modern styles of enamelware dishes, serveware and cookware. You can depend on them for white enamel, splatterware, and vintage looking but modern enamel dishes and kitchenware. I view these dishes as more for home use vs. camping, although the dishes would be suited for both. GSI Outdoors makes enamelware available as outdoor dinnerware, as well as playing to the pioneer lifestyle genre. They offer several different colors of enamelware including red, green and blue speckled dinnerware. Other modern suppliers of enamelware include Peak Outdoors, StanSport and TexSport, along with many western shops that make western enamelware available. A common question is, "Is using enamel dishes safe?" As with any type of dinnerware, it is important to review the safety concerns that many have. This comes mainly from the discovery that vintage and imported dishes contained lead or chemicals which could leach into food products. If the enamel is chipped or rusty metal appears, by all means don't use the dinnerware with food or drinks. Use caution with antique or vintage items, or items made outside of the United States that you don't know about. These are best used solely for decorating purposes. Modern dinnerware sold in the United States usually comes with manufacturer instructions and disclosures. Pay attention to them in taking care of and using your dinnerware. Never use items that are marked for decorating purposes only for serving food or drinks. If you have concerns, the US Food and Drug Administration and Federal Trade Commission are dependable sources for consumer information.